Aromatic rosemary is a great, earthy complement to zesty grapefruit and orange in this show stopping glaze. Only the highest quality hams are worthy. 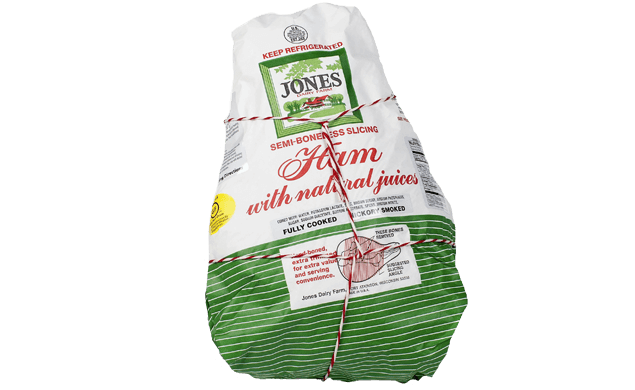 This recipe is made with Jones Semi-Boneless Ham. In medium sauce pan whisk together brown sugar, mustard, garlic, marmalade, grapefruit juice, rosemary, and salt. Bring to boil over medium heat; reduce to low and simmer 6-8 minutes. Preheat oven to 375˚F. Place ham in large, greased roasting pan. Pour glaze over top of ham, covering as much surface area as possible. Loosely cover with foil and bake for 1 hour. Remove from oven and baste ham with sauce from bottom of pan. Increase oven temperature to 425˚F. Return ham to oven, uncovered, and bake an additional 30-45 minutes, basting ham with sauce from pan every 15 minutes. 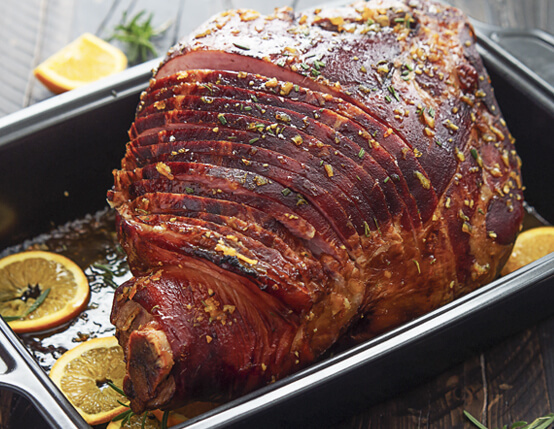 When ham is finished baking, allow to rest for 20 minutes before carving. Just before serving, spoon any remaining sauce in the pan over the carved ham. Serve warm.